In some circles, green juice is a daily requirement for good nutrition. But liquefied kale, cucumbers, and celery isn’t the only bottle of liquid green out there. Many juice shops (and some grocery stores) also sell chlorophyll water or chlorophyll shots, which are about as bright green as a drink can come. And many people can’t stop talking about the many chlorophyll benefits they’ve experienced. What exactly is this green machine and why would anyone drink it? Maybe because wellness gurus spout off a list of claims about what it does for your body. But there isn’t a lot of science behind most of these statements. To become a more knowledgeable chlorophyll consumer, here’s what chlorophyll is, why people are drinking it, and what (if anything) it can do for you to decide if you want to give it a try. If you don’t feel like chomping down on a cup or so of veggies, wheatgrass is also packed with the pigment. It’s made up of 70 percent chlorophyll, so you only need to consume 3.5 grams (approximately 1 rounded tsp.) to get approximately 18.5 milligrams of chlorophyll. Now that’s efficient. However, the evidence that this green pigment delivers on these promises is thin. Let’s take a look at the weight loss claim first. Swedish researchers performed a small study in 2014 where 38 women ate three meals daily and increased their physical activity. 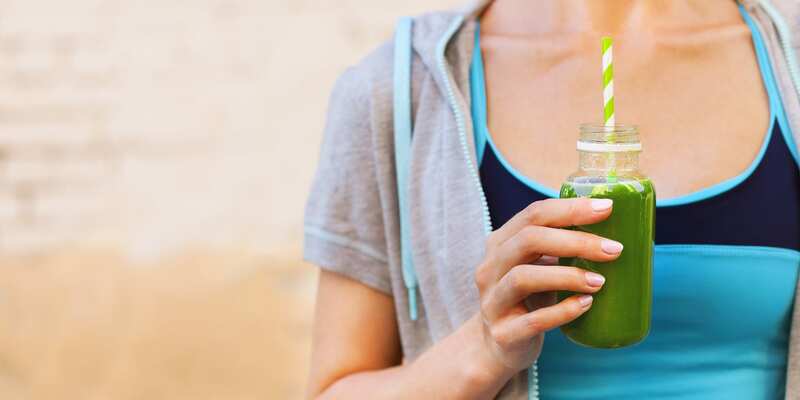 Half of the women consumed five grams of chlorophyll-filled green plant membranes before breakfast each day, while the others took a placebo. After 12 weeks, the supplement group had lost about three pounds more than the control group lost. An earlier study by the same researchers found that consuming thylakoids (membranes in green leaves that contain chlorophyll) may suppress appetite. However, this was another small study with only 20 women. In terms of skin benefits, two studies (one from 2014 and one from 2015) used a topical chlorophyll solution to treat acne. Although the results were successful, these studies were both small (using 24 and 10 subjects respectively) and focused on select populations. Lastly, when it comes to cancer, most studies have been performed in animals. One study published in the journal Oxidative Medicine and Cellular Longevity found that chlorophyllin (the most commonly studied chlorophyll derivative) has anticancer effects— but this study was performed on pancreatic cancer cells in mice. More research is necessary to further examine the connection between chlorophyll and any ability to fight cancer. Although wellness gurus and companies may tell you that there are plenty of chlorophyll benefits and it will do wonders for your body, “more research is needed in order to have conclusive results, and the mechanism behind how chlorophyll works in these cases remain elusive,” Valdez says. If you do decide to jump on this nutritional train, there are a few ways to ingest it. Most people try to capture chlorophyll benefits by drinking bottled chlorophyll water such as Verday. Some juice bars also sell bottled chlorophyll water or chlorophyll shots. You can also take chlorophyll supplements in capsule form, consume chlorophyll drops alone or in drinks, and mix chlorophyll powder with water or blend it into smoothies. If you are going to take a supplement, some evidence suggests we can only absorb about five percent of the chlorophyll we ingest, Giancoli says. She recommends calling the supplement manufacturer or researching it to see if the supplement is formulated to survive the acidity of the stomach and the digestive enzymes of the small intestine so it can be absorbed. Additionally, you should look for third-party labels such as the NSF seal, which indicates the product is safe and contains what it says it contains. Are There Any Side Effects To Taking Chlorophyll? If you’re worried that this green machine can kill you, you may be confusing it with chloroform, a colorless, sweet-smelling compound used in the production of freon. Chloroform can be lethal; chlorophyll, however, has less serious side effects. Some people experience nausea, vomiting, diarrhea, other digestive problems, or green, yellow, or black feces. “But for the general public, chlorophyll is safe to consume,” Valdez says. If you feel compelled to try chlorophyll water or supplements, there isn’t much risk. However, don’t expect to see life changing results. It’s better to put the money you would spend on chlorophyll products toward a healthy diet.